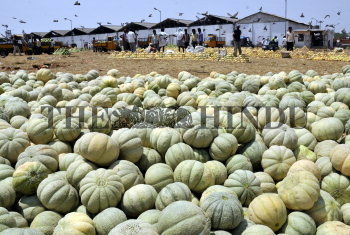 Caption : HYDERABAD (AP/ BL) -21-03-2011- *AGRI-BIZ PAGES *Musk Melons (Cucumis melo) arrive in heaps at the Gaddiannaram Fruit Market at Kothapet on the outskirts of Hyderabad on Monday from Jadcherla in Mahbubnagar and Kurnool Districts . A summer time delicacy known to bring down body heat , is in great demand -and being sold at Rs 1600 -Rs 1800 per heap of 55 kilogrammes . PHOTO: P_V_SIVAKUMAR .